I’m sure Erik and myself are not alone in hearing all the dire warnings of a. Eating too much b. Not exercising enough c. Eating too much sugar and d. Eating too much red meat. But I think that as you get a bit older, appetites can change. Right at this moment in time, on a very cold icy morning in East Yorkshire, I am not yearning for Sausages and Mash but have come across some great recipes which make my taste-buds tingle with anticipation and are Salad and varieties of crunchy coleslaw type dishes. 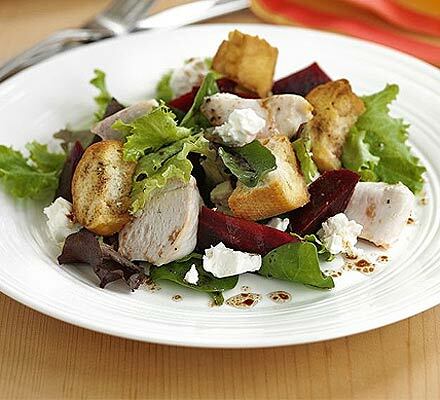 So here is the first of these, a Warm Chicken Salad Recipe. Now, doesn’t that tempt you? This Warm Chicken Salad recipe is just perfect when you are gasping for some warm crunchy fresh food in the middle of winter. Also perfect all year round, and if you grow your own you can add whatever is ready in season. Imagine juicy chunks of your own Asparagus, or mustardy salad leaves, your own cucumber chunks. The list is endless - just use your own imagination. Heat oven to 200C/ fan 180C / gas 6. Spread the chunks of uncooked chicken and the baguette pieces over a shallow roasting tray. Drizzle with 2 tbsp olive oil and toss to coat. Season then put in the oven for 15 minutes until the chicken is cooked through and the bread is golden and crisp. Bring a small pan of water to the boil, cut the french beans in half and cook in the water for 4 - 5 minutes - drain well. Place the walnuts in a dry frying pan and swirl around for 3 to 4minutes. Don't cook them for too long or they become bitter. Whisk together the remaining olive oil and balsamic vinegar to make a dressing. Split the salad leaves between serving plates, scatter the beetroot on top followed by the green beans and pieces of goats cheese and the walnuts. Toss in the warm chicken and golden bread chunks, drizzle with the dressing and serve straight away. Well, that’s the first of my desperate to eat warm salad recipes. This Warm Chicken Salad recipe looks so fresh, comforting and crunchy, so guess what Erik and I will be eating tonight? Really looking forward to it and hope you have a go too. What’s Happening Here in 2014?